Why Should You Outsource Mobile App Development? Over the years, the mobile phone has evolved from a mode of communication into a hyperactive way of life. With the advancing technology, people are more inclined towards smart phones. Hence, no matter what your business may be, having a mobile app for your business can cover more customers and help you retain them. If you are thinking of building a mobile app for your business, outsourcing them to a development company is the most economical and technically feasible approach. From the perspective of a dedicated mobile app development company, here we have listed the main guidelines that can help you get started, keep updated and finally launch your own business app. We assume these points will help you to understand the basic requirements as well as your involvement required for pulling off the project successfully from start to end. Choosing the right development company: As you are here to develop a mobile app, you need to consider a company which has a dedicated app development team and a robust infrastructure to provide you with all the support that is required during the process. You can request to view a few apps developed by them and review them to get an idea of their quality of work. Communication: Once you choose a development firm for your app development, chances are that both of you will be working together for a substantial period of time. So, make sure to collaborate with someone in the company with very good communication skills. A contact person who understands you and whom you can understand as well. More than the quoted price, or experience, a good communication is the best outsourcing criteria anywhere. Explain your requirements: There are several ways in which you can explain your requirements. You may just have an idea for an mobile app. Or, you may have a full fledged business plan. Whatever that is in your mind, communicate your idea to the experts in a very simple language. With years of experience in this area, the technical experts will analyze your requirements, refine them and present you with the best possible, robust and scalable solution as per your budget, timeline and your available infrastructure. In case you do not understand their proposal, do not hesitate to ask them for clarifications. It is important for you to get an idea of the final product and its features that will be delivered to you before you proceed any further. Consider phase wise delivery: In case your project takes longer than a month or two, you can consider phase wise software delivery. This will help you in understanding your software better and think about new ideas as well. Respond with clarity: Once your mobile app is under development, the team will send you updates on its progress. Make sure that you are available to go through their updates and answer their queries on time so that the development does not come to a stand still. Allow generous time: Unlike the speed of a mobile app, the development of the same requires hours and days of planning, coding and testing. Take time to consider outsourcing companies, review their quotations, collaborate with them and finally proceed with one. It is just the way you go on with your business deals. Quality requires time. Hence, allow enough time to be invested into the project rather than rushing it and compromising its quality. There are several other complex factors which need to be addressed while developing a mobile app. But you do not need to worry about them. The technical experts of the development firm ensure this aspect for you. Feel free to talk about your concerns and trust your instincts. Big thanks for posting such informative and well-written blog. Came to know a lot about the importance of outsourcing mobile app development, courtesy all the nitty-gritty information offered by this blog. Looking forward to reading more write-ups. Mobile app development is undoubtedly the talk-of-the-town these days! And almost all the e-commerce businesses worldwide are looking for web development companies that can provide the best and the most user-friendly of apps for their customers. 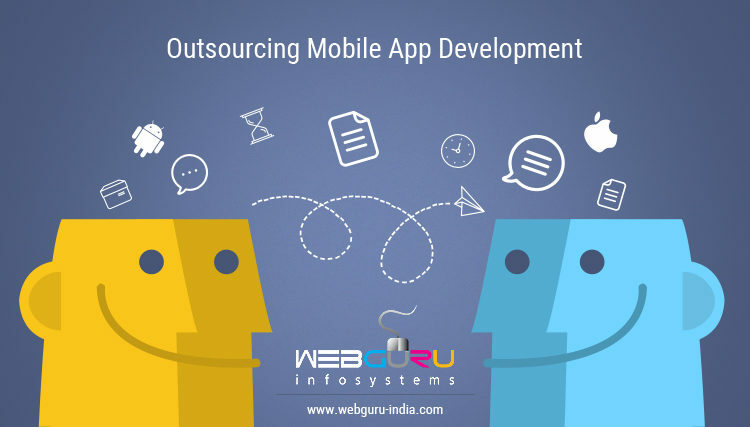 This is one write-up which everyone must read before outsourcing an app development company. Very well-written I must say! Mobile app development is undoubtedly the hot topic these days. And almost every one running an online business looking for a mobile app development or web development companies. I know a lot of people who do it these days but you have to be really careful about who you outsource your work to. I have had some trouble in the past but this blog explains everything nicely. Very useful post. Thanks for sharing great article. The blog Mobile app development was absolutely fantastic! Thanks for sharing the blog. Great job, keep it up. It has been simply incredibly generous with you to provide openly what exactly many individuals look for.